Premise: A group of new FBI agents are the prime suspects in a terrorist attack investigation. Verdict: Too much soap, not enough intrigue. I am guessing that the intention behind this show was to make a soap/conspiracy thriller/action-adventure/whodunit hybrid. Kind of like Grey’s Anatomy/Rookie Blue with a twist. It is not necessarily a bad idea. Unfortunately, I think they went in too heavy with the soap elements and not deep enough with the conspiracy. But… maybe it is too soon to tell. 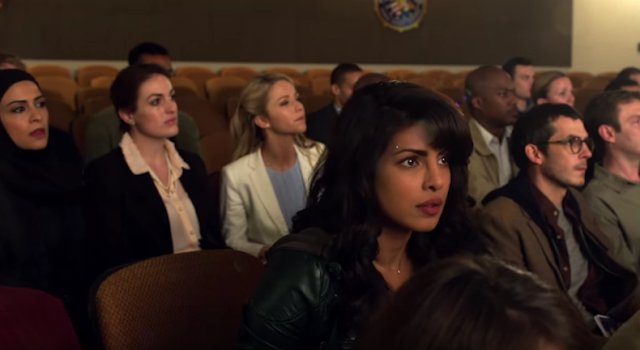 At the beginning of the episode, we see the new FBI recruits arrive into Quantico. We follow them throughout the first few days of their training [I wonder if the actual training is anything like that… I am guessing no]. Relationships, alliances, rivalries are formed. It is very Grey’s Anatomy at this point [without the cleverly written dialogue]. Flashforward several months into the future and we discover that one of this recruits detonated a bomb in Grand Central station. Who? Why? I am curious at this point. But then we continue to jump back and forth in time for the rest of the episode which was extremely annoying. I think we were getting too much premature information about what will happen in five months before we got to understand what was happening in the present. As a result, instead of being intrigued and looking for clues… I was a bit bored. Take Damages for instance. In case you haven’t seen it, the legal thriller opens with the image of Ellen – the protagonist - stepping out of an elevator. Her clothes are torn and she is covered in blood. She runs into the street in a panic. And that is all we see before the episode jumps back in time to Ellen interviewing at law firms. By that point the viewer’s mind is in overdrive, trying to find clues everywhere. The rest of the flashforwards are brief and equally cryptic [and oftentimes misleading]. Now… that is intriguing. No dialogue, minimal information [open to interpretation] and a series of hunting images. That is what Quantico needed… instead, they kept giving us interrogation scenes [At least Anthony Ruivivar was there]. OK, fine, Damages was a dark show… and this is more of a soap. But a soap can be intriguing too. Scandal has heavy soap elements and an important conspiracy plot-line. They both work. But think back to S1. Shonda took her time to introduce the characters and relationships (the soap part) before she presented the B613 conspiracy. At the moment… I don’t care enough about the characters on Quantico [that might change] and the conspiracy is not enough to satisfy me since I am a genre fan. In the pilot episode a bomb blew up Grand Central and a guy committed suicide. Yet the stakes didn’t feel high enough. Why? Because I can’t even remember the guy’s name [I am not crazy about the leading lady either]. Should you watch it? I wouldn’t say no… it might get interesting, but… I think your Sunday nights would be better spent watching cable… or Netflix. yeah completely agree. best thing was seeing Anthony there. it felt a bit too shallow overall and I had issues with chopra - her acting did not particularly impress me...It was so obvious to me that she was acting... maybe it improves but I do not think I ll keep watching . any other new shows u watched and liked? I did NOT like her... she was so... beauty pageant .... that's all... I am guessing this will be watchable fluff... but no more.